You’re not alone. As you already know, Hulk is an awesome comic character from Marvel and has been featured in the avengers as well and thus has gained a lot of recent popularity in the gaming market. There have been a lot of new websites that have developed small, fun flash-based hulk games that you can play online. Here’s our list of the top 5 websites where you can play hulk online. 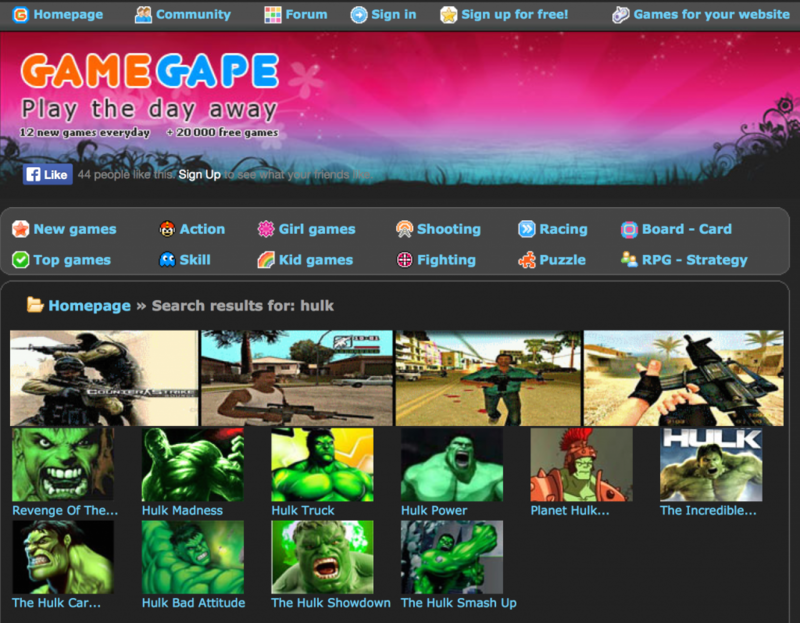 GameGape offers a wide variety of flash games ranging form hulk to spider man. Apart from cartoon character games, they also offer flash games over a huge variety of categories like puzzle games, shooting games, skill and strategy based games and even a few role-playing games. Disney has one of the best game to offer when it comes to Hulk games. Gamma Storm Smash is a very well developed game with amazing graphics and good gameplay. Apart from Hulk you can find some of the best quality of games on every cartoon character, from Spinderman to Star wars. HulkGames.pw is a dedicated website built just for Hulk flash games. The site offers more than 100 Hulk flash games and if you’re interested in more then you’ll find everything from Simpsons to Dora the Explorer games. This is one of the most popular gaming websites for hulk related games and after disney offers the highest quality of graphics and gameplay when it comes to flash games. The site is dedicated to hulk-only games and you will not find games from any other superhero. However, you might find games like Hulk vs Superman which just makes it a lot more interesting. You can even download wallpapers and watch trailers of the newest upcoming Hulk and The Avengers movies. MyHulkGames is a very well designed website that is easy to navigate and loads fast. They offer a wide variety of games, while most of these games are built around the hulk storyline and character. Well, those were our top 5 websites to play Hulk online. If you’ve got any other recommendations or favourite websites that you’d like to share, please use the comment section below and let us know about your favourite websites.